Mary Russell and her husband, Sherlock Holmes, have stirred the wrath of a murderous secret organization bent on infiltrating the government. Now they are separated and on the run, wanted by the police, and pursued across the Continent by a ruthless enemy with limitless resources and powerful connections. Unstoppable together, Russell and Holmes will have to survive this time apart, maintaining contact only by means of coded messages and cryptic notes. But has the couple made a fatal mistake by separating, making themselves easier targets for the shadowy government agents sent to silence them? 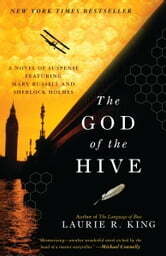 A hermit with a mysterious past and a beautiful young female doctor with a secret, a cruelly scarred flyer and an obsessed man of the cloth: Everyone Russell and Holmes meet could either speed their safe reunion or betray them to their enemies—in the most complex, shocking, and deeply personal case of their career. BONUS: This edition contains an excerpt from Laurie R. King's Pirate King.